Moving the piglet's house etc. After our first full week of clear skies and warmer temperatures the farm has jumped into full swing. The long wait is over and with soils finally drying outdoor seeding and transplanting has begun in earnest. This week we seeded carrots, beets, radishes and mustards and transplanted broccoli, cauliflower, cabbage, radicchio, chard and summer squash as well as our field of potatoes. Coming up next week we will transplant new successions of lettuce and spinach and begin seeding more summer crops like cucumbers and beans. It’s a busy and at times stressful season but spring is also a time of so much amazing potential! Every seed sown or plant pushed down into the earth has the potential to grow and thrive and feed people. It never gets old. Growing food is a challenging and yet oh-so-rewarding adventure. We have welcomed our first two interns to the farm. In late February, Stephanie who moved here from New Jersey/NYC joined us. Stephanie received her BA in Literature and Art History and recently traveled throughout Greece and Cyprus. 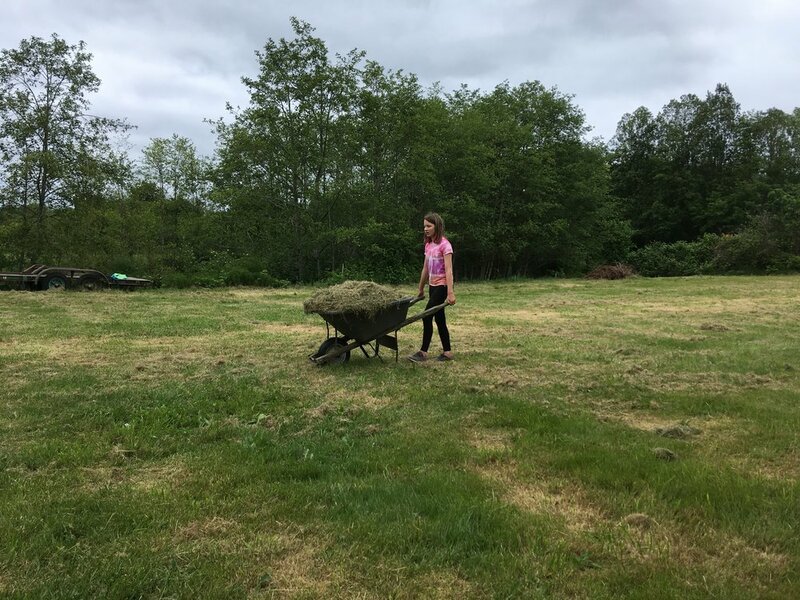 In a total change of pace she then decided to follow a long-held interest to learn more about sustainable small-scale agriculture and had found herself here on Vashon. We are so excited to have her with us! In this last month Stephanie has proven herself a valuable asset to our farm crew. She is a fast learner and detail-orientated with an eye for order and presentation. Tina arrived in mid March after finishing a yearlong internship with St. Johns Creamery in Monroe, Washington. There she had her first experience working on a farm and learned the ins and outs of a small-scale goat dairy. Growing up in Las Vegas, Tina always had a love for the natural world. As she became aware of social justice and food insecurity issues she made the decision to become a farmer. 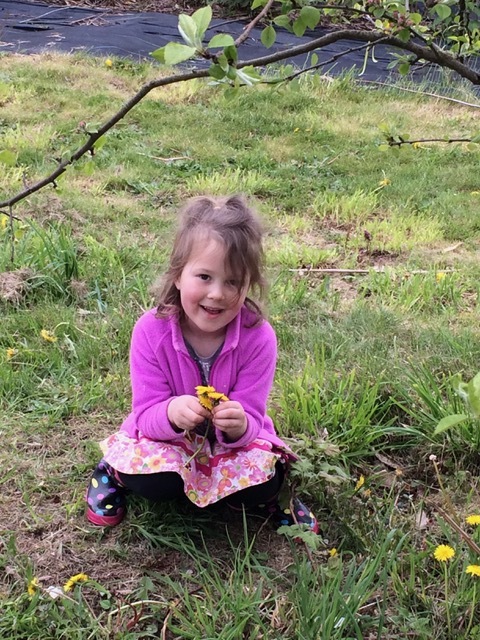 She hopes one day to have a community-based educational farm and plans to spend the next few years learning all she can about various growing styles and practices. We are thrilled to have her here and appreciate her enthusiasm for learning and her kind and thoughtful manner. Our summer intern, John, will arrive in mid May. 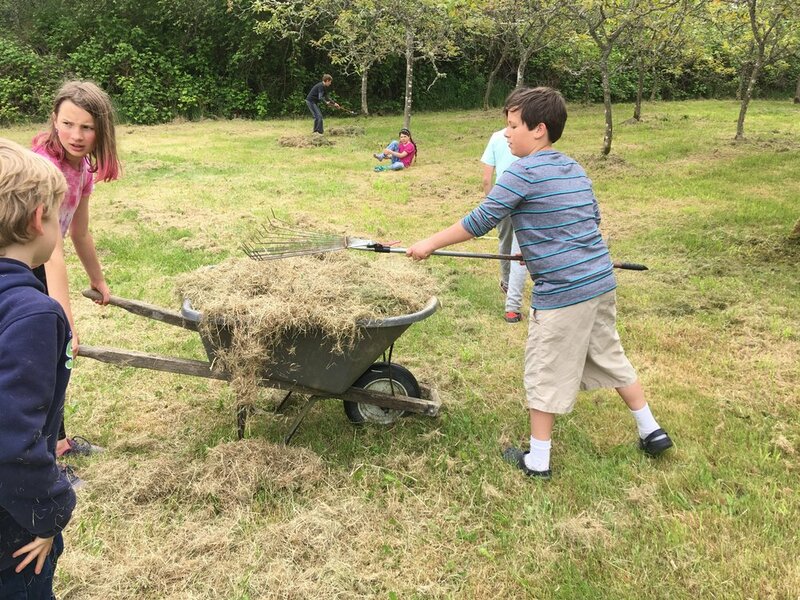 Pacific Crest students have been busy on the farm as well! Throughout the winter and spring, Elementary groups have joined us for many projects. 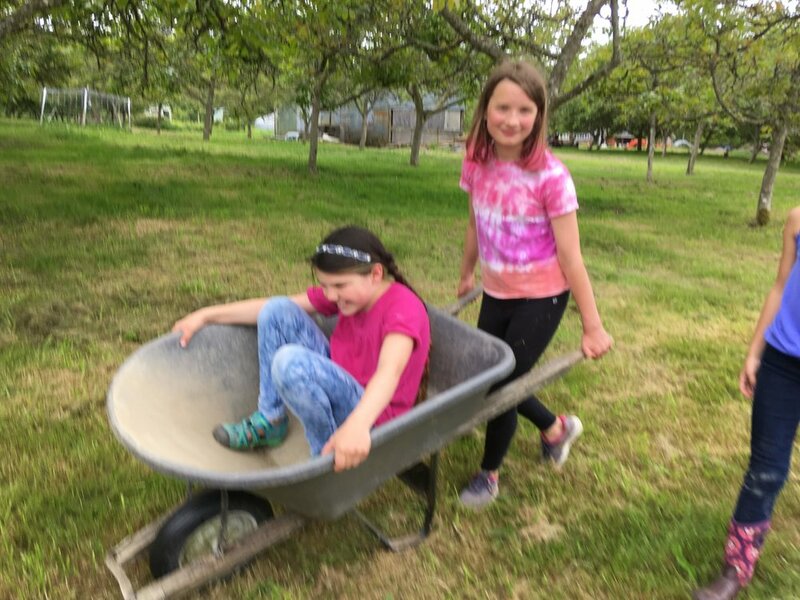 Most recently we have seeded in the greenhouse and potted up strawberries for the plant sale, cleared apple orchards of blackberry, hauled fallen branches to the burn pile and pruned back our strawberry patch. They love helping with animal chores and collecting eggs! 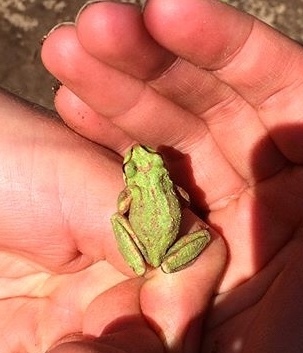 Middle School students returned to the farm in March and began working on a restoration site. Each farm group has been assigned a 20-foot section of the upper pond to revitalize. Each site is overgrown with blackberry but each also has some amount of native plants to preserve. Invasive removal has begun and groups are also considering what native plants they want to plant and where they will go as well as any structures or habitat enhancements they would like to develop. Their work will be visible in the pond area behind the stage at the Spring Celebration. They have also begun work on a pizza oven! The oven is being built at the outdoor kitchen. Another place to check out during the May party. 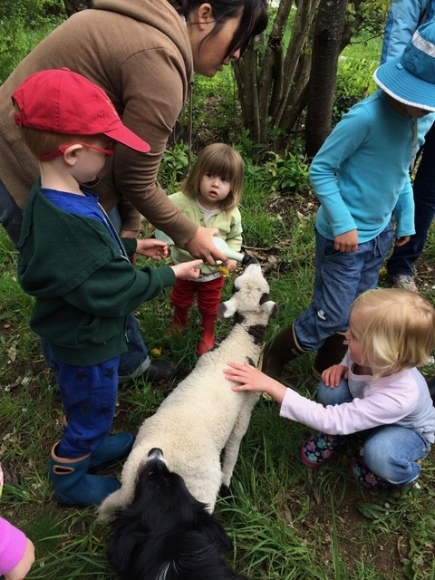 Last week and this week we welcome our Primary classes to the farm for springtime exploration. What a fun group! The primary students always bring such a sweet excitement and enthusiasm for discovering the farm. They have plenty of questions about the animals and people on the farm and many were very ready to be assigned farm work! Just this past weekend we hosted our first work party of the season. Thank you to all the families who were able to come out and help on the farm! We had groups help clean greenhouse plastic as well as weed the edges of the greenhouses. We weeded out our garlic and strawberry crops and prepared the carport for painting. We look forward to hosting the entire Pacific Crest Community at our annual Spring Celebration in just two weeks! 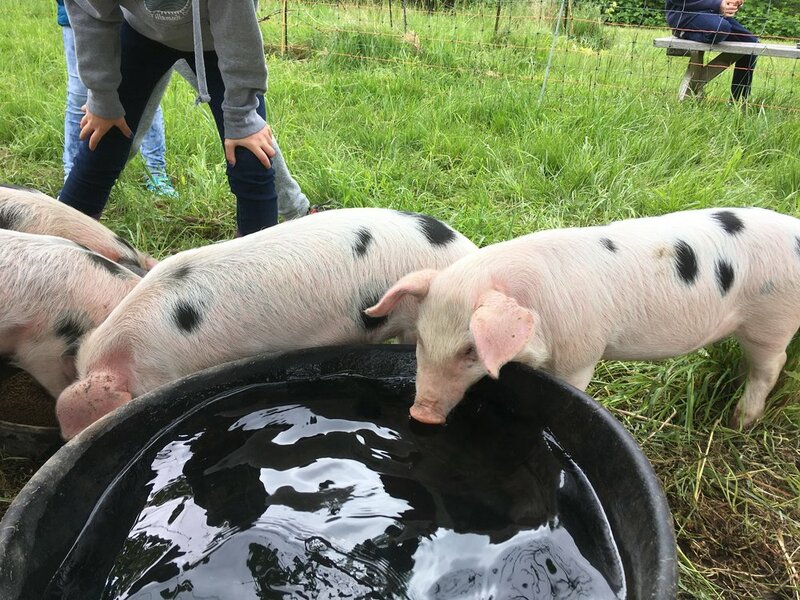 We’ll have newly arrived baby piglets to meet! We hope to see you here! Greetings from the Farm! After a quiet couple of months, the pace is picking up once again. Signs of spring are all around, despite the brief cold snap expected tomorrow. Today was a classic day of extreme PNW spring weather with high winds (power outages!) lowering temperatures, sunshine, rain and even a little snow. When we do get freezing temperatures in the forecast, we have to make sure we take care to turn heaters on in the well houses, drain all hoses and outdoor water pipes, put extra cloths on our greenhouse crops and tender starts, turn heat lamps on in the chicken coops and harvest as much produce as we can! In the morning, we’ll need to bring warm water out to the animals to break up the ice in their waterers. Because these cold temperatures are not the norm for us, we have a little back and forth in the spring months. One day seeding radishes in the ground the next day scraping snow off the greenhouses. In the quieter winter months there is still plenty to do. We use this time to plan and prepare for the coming season. There are orders for seeds, amendments, materials, plants, potting soil etc. We draw out field maps and plan all our successions of crops. There is also the process of hiring our three seasonal interns and scheduling various farm events. We do find time for working outdoors as well! We’ve continued to harvest and periodically our farm stand is opened with fresh winter-time produce such as broccoli, cabbage, carrots, eggs, squash, salad, kale, onions and garlic. Throughout the winter, elementary students have been visiting the farm on Thursdays. We’ve spent our time finishing off fall projects like our dry bean threshing and sunflower seed saving. We have gathered windfall branches and made burn piles and stocked firewood stores for spring overnights and summer camps. The past two weeks we have been digging the last of our overwintering carrots, a favorite activity for sure. There is nothing quite like digging for buried treasure to keep children engaged! We will begin spreading compost, planting native plants, cleaning and organizing our tools and greenhouse seeding in the coming weeks among other projects. And we will welcome back the middle school students in March. As we near the end of the growing season and approach the Thanksgiving holiday, it seems fitting to take a moment to reflect on the bounty and the beauty the farm has offered us this year. This week as middle school students worked with us to cut, pull and drag tomato plants from the high tunnel, a few recalled that they had helped to seed those plants many months before. From those tiny seeds in their hands came thousands of pounds of tomatoes in every color, shape and size. And now they lie in a heap of tangled vines rotting back to the earth. 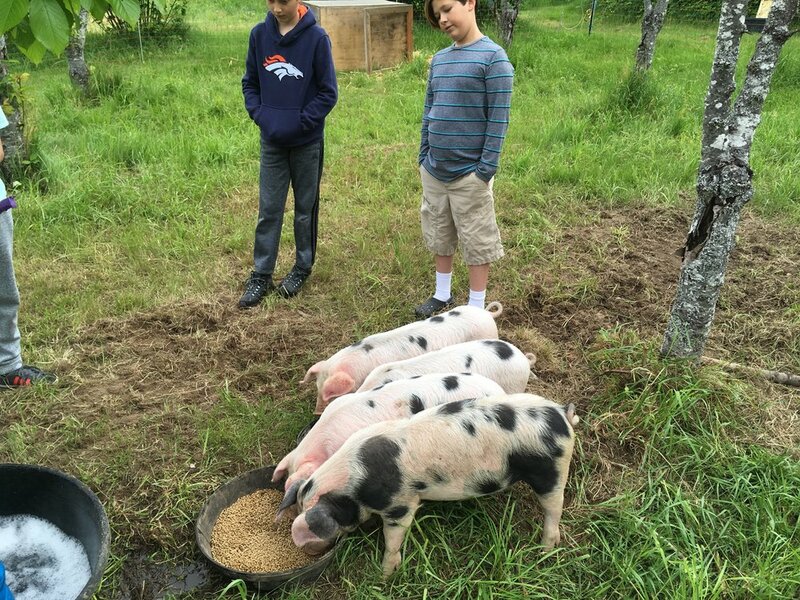 It’s such a valuable lesson when students are able to experience the full circle of food production on the farm. 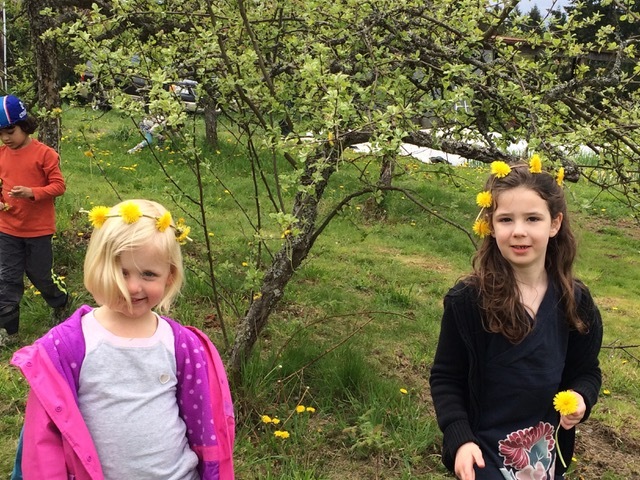 As elementary students returned to the farm this fall a number of students were thrilled to see a 50 foot bed of golden sunflowers blooming in front of the greenhouse. They had planted those tiny seedlings during farm camp in early August. Now as the plants die back we have cut the heads and are drying the seeds for bird food and to be saved for planting next year. This week we pulled the remaining plants and added them to the compost. In these past few weeks students have been helping to bring in the final harvests for this year; from cutting broccoli sprouts to hauling in winter squash to picking Brussels sprouts. They have threshed and winnowed dry beans (always a favorite!). They’ve gathered chestnuts and pressed apple cider. They’ve dug potatoes, carrots and beets. Recently there has been a series of “tests” of our popcorn to see if it is good enough to sell. Turns out it is but there might not be much left to sell! The children’s exposure to the science and labor and pleasure of growing food is so important. It is helping to create a deeper understanding of their world and that is certainly something we can all be grateful for. Bob and I are grateful for so much as we look back at the year. We are grateful for many warm and sunny days that led to great crop yields and busy farmers markets. We are grateful for three hard-working, committed interns who worked beside us for most of the season. We are grateful for a new hoop house, a bottle-fed lamb, 6-pound sweet potatoes and a sweet new farm cart off Craigslist. 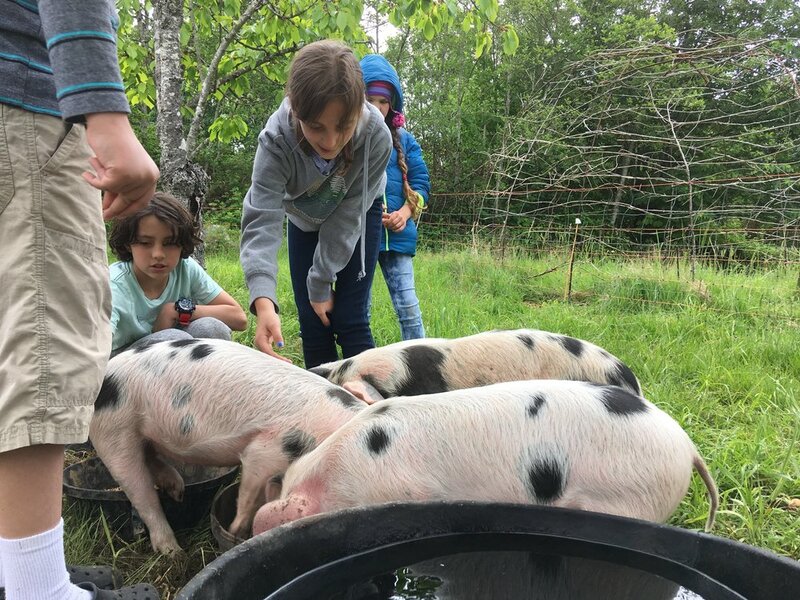 We are thankful for the enthusiasm and inquisitiveness of the students and we are thankful for the teachers who encourage them to work hard, explore, contemplate, and connect to the farm. We love the work that we do here and consider it a great privilege to steward this land. Fall is here and the farm is changing daily. 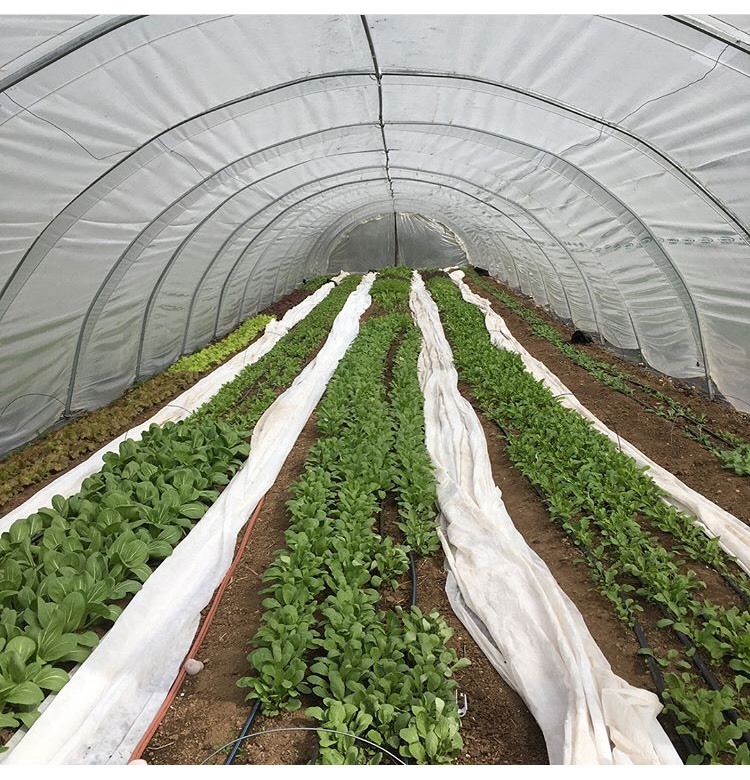 There is a sense of urgency in our work as we clear fields of summer crops, throw out cover crop seed, and plant overwintering greens in the poly tunnels. Not quite the urgency of a frenzied spring but more a sense of working against time and weather, trying our best to wrap up projects, get things put back into place and finish our plantings while the rain and cold hold off. In the past week we have said goodbye to two of our seasonal farm interns. Every season two or three young adults who are interested in learning more about small-scale organic farming join us. They sign on for a full season, March through October, working 5 days a week. They share in all farm tasks from seeding to transplanting, harvest to marketing, animal husbandry and engaging with students on their farm trips. We take care to teach them the systems we have in place here, soil science, farm planning, farmers markets, food preservation, and many other aspects of farming. They tour other island farms monthly, learn from those farmers as well as meet other volunteers and interns from all over the island. This season we are grateful for the hard work and dedication shown by our farm crew: Rochelle Waite from Cambridge, MA; Mikey Richardson from Louisville, KY and our fabulous second year intern, Jessica Davidson from Gig Harbor, WA. We would not be able to run the farm the way we do without them. As the season winds down Rochelle is heading to Los Angeles to live with her sister and look for work in the non-profit sector. Mikey is returning to Louisville to manage a large CSA farm there. Jessica will remain with us through November before moving to Tacoma where she plans to combine growing food with her work in the food service industry. We wish them the best and as always will keep in touch! We have had some fabulous events on the farm in the past two weeks. Thank you to all who made it out for our annual Cider Press! The weather was beautiful and although the season has been tough on the apples and pears, there was enough cider made for everyone to have at least a cup or two. The following week we welcomed the entire staff out for a retreat day. Again, the weather cooperated with us and we had a lovely day with a tour of the farm, discussions, and break out groups for all levels and a delicious meal prepared with all island produce. We have been thrilled to welcome back our student groups this school year! Many students spent time at the farm over the summer; between farm camps (we had 3! ), family picnics, and Tuesday harvest volunteering. It has been fun to talk about the changes in the past months and for many to see work that they did in July come full circle in October. In the fall season students groups work with us on a number of tasks. Primary groups have come out to harvest their pumpkins and journey through the farm. Elementary classes are working on harvesting and shelling dry beans, gathering hazelnuts and chestnuts and collecting other seed from sunflowers and lettuce. 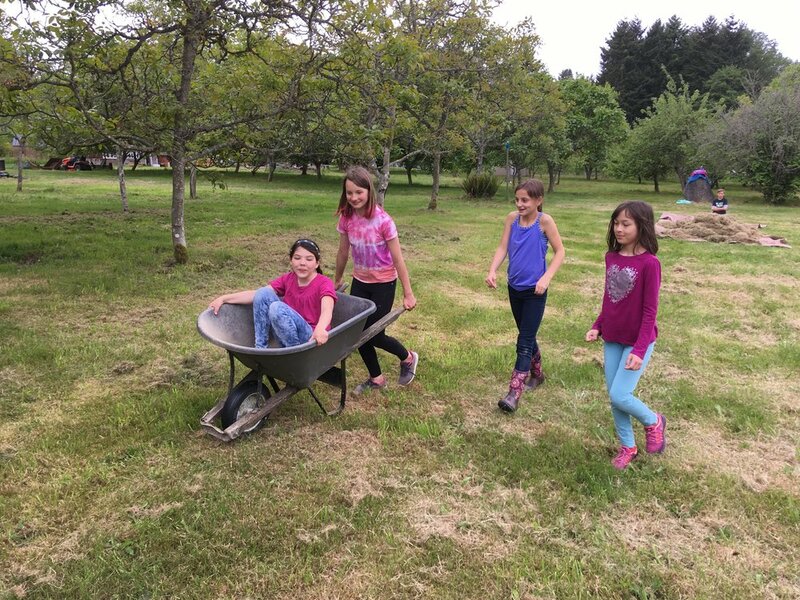 Middle school groups are harvesting an array of produce for their school market on Tuesdays and also helping us with the harvest for the Vashon Farmers Market on Fridays. We hope to see many of you out on October 28th for our fall work party! We will be planting our garlic as well as clearing the tomato greenhouse as well as other tasks. Join us! After a single beautiful sunny day, it’s easy to forget just how wet and grey the weather has been. This spring has offered us more than its fair share of mud. Despite the continued rain we are doing our best to get on with the demands of spring farming. We have laid plastic sheeting on beds to block the rain and try and dry the soil enough to get plants in the ground. Peas, lettuces, brassicas radishes and spinach are finally outdoors! There are still hundreds of tiny little seedlings ready to be transplanted and the first chance we get that’s our priority. In the meantime we are weeding, spreading compost and fertilizer and keeping a close eye on the forecast. Last week we welcomed our 13th and final lamb of the season, another healthy male. That’s officially one female and 12 males! We were not expecting to have lambs this year. We had one ram lamb from last season that we thought we had successfully castrated but…. oops. We are now trying to sell up to 5 of our ewes with their babies to lighten the load on our pastures. So far, we have sold 2. We have also welcomed our third and final intern for the season. Mikey Richardson is from Louisville, Kentucky and just finished his second week on the farm. Mikey spent last season working at Field Day Farm in Louisville where he helped grow vegetables for a large CSA, farmers markets as well as wholesale. The farm also hosts local schools and provides farm education to the community. He has a passion for herbalism and wild foraging, which drew him the PNW. He is a great fit for Pacific Crest Farm and we are grateful to have him join our farm team. Pacific Crest elementary groups come out every Wednesday. The baby animals have been a big hit and large part of our day. Cooper is of course a highlight and they have been able to bottle feed and hold him over the past few weeks. 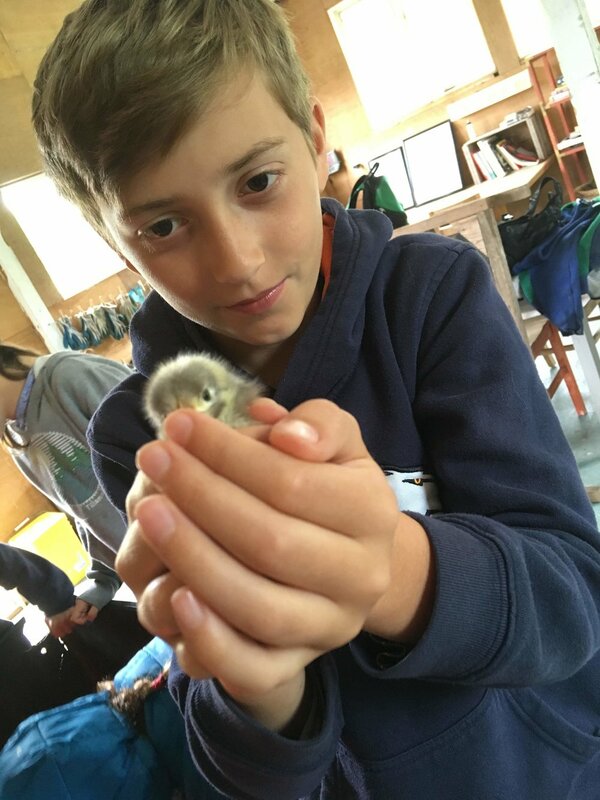 There are currently 30 new chicks living in the classroom and many children enjoy calmly holding the little birds for as long as they’re able to. It makes me smile that despite all the new additions Lucy and Energy, our elder farm dog and cat, always get the most love! Middle school students have been working on some new projects. They have built two firewood storage sheds, one at their outdoor kitchen area and one closer to the farmhouse. These will be a great resource for the farm to stack and store larger wood from our pruning and thinning projects. 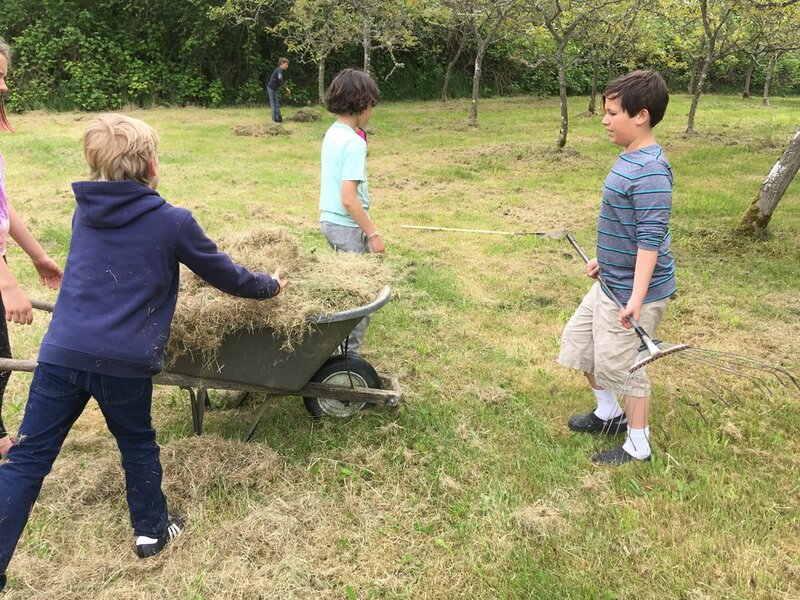 Tuesdays and Fridays are typically harvest days on the farm and the middle school groups have been able to jump right in and help this month to harvest greens, wild onions and sprouting broccoli. They helped reinforce our turkey house, which collapsed last year, in preparation for 30 turkeys arriving in June. Last week with the oversight of teacher Rob, they began an art installation project that we are all very excited about. Come out to the work party this weekend and get an early peek! As the cold and wet winter weather continues, the farm still feels very much at rest. The ground is saturated, the soil still cold. The ponds are full to almost overflowing. Fruit tree buds are tight and the Chorus frogs have yet to begin their late winter songs. Despite winter’s lingering there are small signs of spring to enjoy. The Indian Plum leafing out, garlic just barely poking its head up, robins and flickers retuning in mass, the Hooded Merganser back in the pond searching for his mate. We’ve used this slower time of year to work on planning and preparations for the coming season. Seed orders, field maps, planting plans, intern interviews, brainstorming new ideas. We took a vacation to the desert to recharge. Tree pruning began in earnest in February and last week we brought in a wood chipper and turned those huge piles of branches into mulch for the orchards. We started the first seeds in the greenhouse on heated tables early in February. Onions are always first but they’ve since been followed up with early greenhouse successions of beets, kale, spinach, lettuce and mustard as well as our first outdoor transplants of the season; peas, broccoli and cabbage. It felt pretty unbelievable to be seeding tomatoes, peppers this week in our heavy hats and coats as the rain poured down and the wind shook the greenhouse. Some day soon the weather will change and we’ll be ready with thousands of tiny little plants to dig in and seeds to scatter. 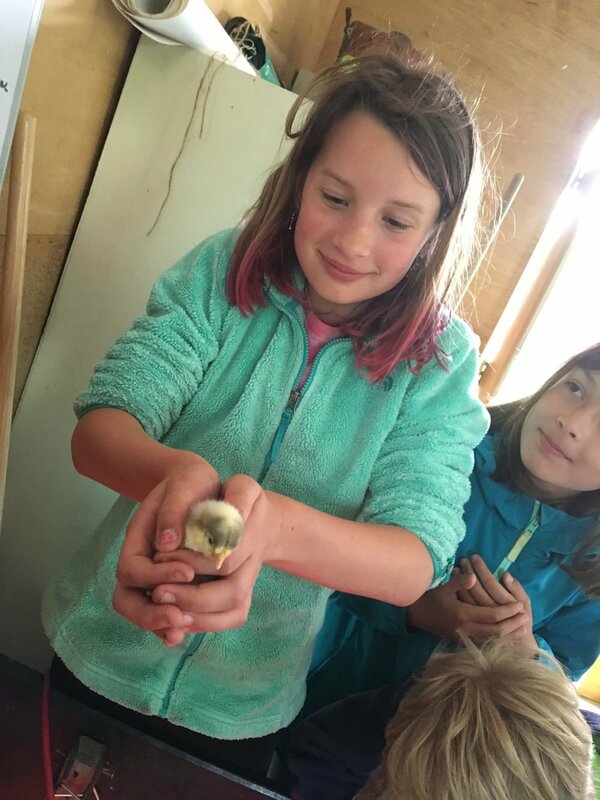 All winter long the Elementary classes have come to the farm and lent their hands. They have helped thresh dry beans and shell popcorn. They have worked hard gathering prunings and windfalls and carrying them to the burn or wood chipping piles. Today we cut blackberries out from the bases of trees in one of the apple orchards. Piles of gravel have been dispersed to fill potholes in the driveway. 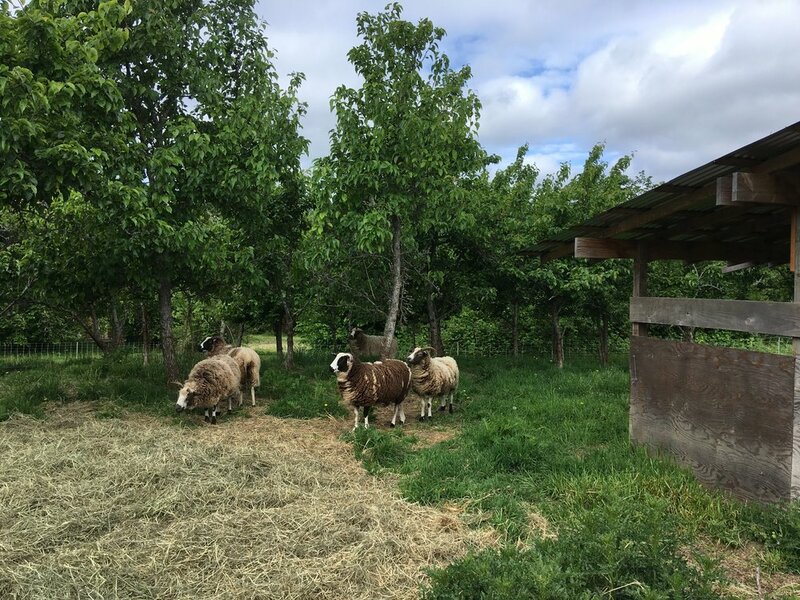 They are always eager to help with the animals; gathering eggs and bringing straw to the nesting boxes of the chickens as well as feeding hay to the sheep. Energy and Lucy (farm cat and dog) have received hours of rubs and kind words! 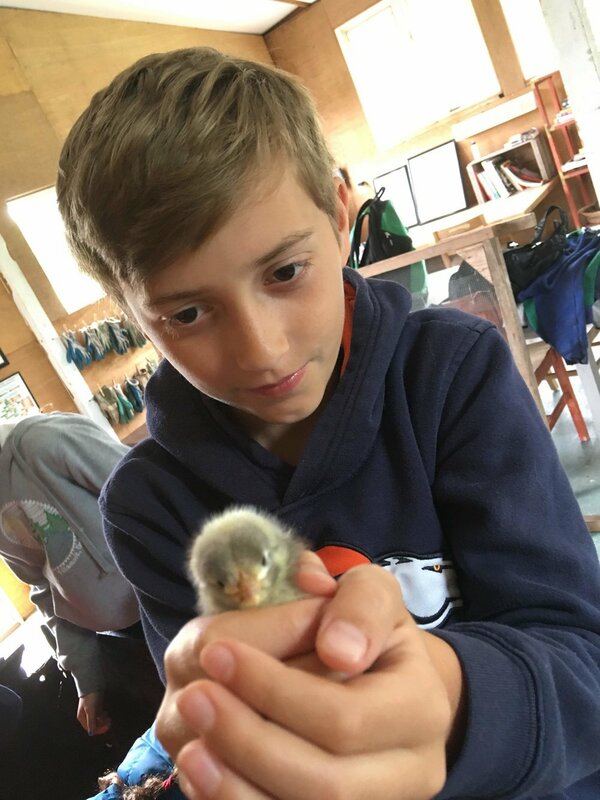 Last week the Middle school students returned to the farm. It feels like it has been a long time since we’ve seen them! They jumped right into a project they had begun in the fall and finished digging, laying and burying electric lines to the outdoor kitchen. This weekend an electrician friend will be out to help us hook up the power. Finally we will have lights at the student’s camping area! Yesterday, a Middle school group worked with Bob to cut and peel large cherry branches that they fashioned into a fence. They installed the fence at the top of the hill where the driveway meets the pond. It looks beautiful and will help warn folks of the pond’s presence as they drive up. This month we have welcomed back Jessica for her second year living and working on the farm as one of our interns. Jessica joined us last April from Gig Harbor, where she hopes to start her own farm in the future. She stayed on into late November to help with the turkey harvest before heading to Thailand and Vietnam to travel this winter. We are grateful to have her with us for another season! Joining her last week was Rochelle from Cambridge, Massachusetts. Rochelle developed her interest in farming during college, when she was awarded a fellowship to study urban agriculture in Philadelphia. She is excited to challenge herself to a full season of learning what it takes to grow food with and for the community. We are still in the process of hiring our third intern to balance out the farm team. The farm’s interns are an integral part of our operation. They commit to 8-9 months working with us 5 days a week and experiencing all the elements of farm management. They are people who are passionate about food production and youth education, and who have sought out Pacific Crest Farm because of its unique blend of both. We couldn’t do what we do without them! The wet weather has returned and here on the farm we are wrapping up many kinds of farm work better suited to drier conditions. We have finished pulling, tilling, composting our summer-planted fields and they now have a lovely covering of green manure (cover crop). We have cleared the greenhouses of peppers and sweet potatoes and have planted all of our overwintering greens. Think fresh lettuce, spinach and mustards in February! We’ve pulled up thousands of feet of drip irrigation and hoses, no need for those anymore! We’ve wrapped up the tree nut harvest and have already sold out of hazelnuts! They were harvested primarily by our elementary students (thank you!) and are always a favorite at our market and farm stand. Our chestnut harvest is nearly 150 lbs. and these are selling well thanks to a new chestnut roaster who is selling at our market. Once customers can taste a freshly roasted chestnut, they almost always want to buy some for themselves! This weekend will be our final Farmers Market of the season. We have been in town every Saturday since April 2, that’s 34 weeks! Saturday mornings we arrive to the Village Green by 8:30 am to set up our booth and be ready to sell our produce from 10-2pm. On Wednesday evenings from June thru early September we also sell produce and flowers as part of smaller, food only market. The market is a large part of the farm’s income and we enjoy getting a chance to connect with valuable customers and meet new ones. Our island market is small but lively and diverse and always worth a visit. We’ll be back at it early next April! We had some lovely visits from the primary students late last month. They came out to explore the farm and collect a carving pumpkin. They all enjoyed a work period either harvesting nuts or shelling dry beans. They enthusiasm and joy for the farm is contagious! We hope you’ve been enjoying the middle school farm stand at school. We’ve had a great year so far! The students have been very organized and engaged in the process. They are planning on one more market after Thanksgiving and then they’ll be breaking until late spring when the farm starts up again with fresh greens! The Farm has changed dramatically in the last month. With cooler temperatures and the returning rains, we have seen most of our summer crops fade away. Summer squash and tomatoes will be ripped out this week and tossed into the compost pile. Cucumbers, winter squash plants, beans and corn have already been tilled under. Just in the past two weeks many of our tender greens, growing outdoors, have faded considerably and so our salad harvest have gone from 60 lbs a week to about 20 lbs. We are switching gears in our greenhouses, removing the remaining summer crops and quickly transplanting new lettuces and winter greens. These plantings will produce slowly through fall and by late winter will have a burst of growth that will give us our first harvests for next season’s farm stand offerings. In the past two weeks we have been working manure and okara into the fields and seeding the areas with a rye-vetch winter cover crop. What is okara you might ask? It is organic soymeal, a bi-product of the tofu making process. Vashon’s Island Spring Tofu Company will deliver it free to your property and we take full advantage. The okara is nitrogen rich and we can get it in large amounts to help us recharge the soil fertility in our fields. We plant cover crops to improve soil organic matter and soil fertility, suppress cool-season weeds, prevent soil erosion, and create a better seedbed for spring planting. This week we adopted twenty new chickens from another island farm that was shutting down. These chickens are about two years old, so we expect they will be providing the farm with eggs for another year or so. Our flock of laying hens now totals 60 (with some of the hens transitioning out this winter). Living with the hens we still have two roosters and one duck. The duck was part of a flock of ten ducks started in 2012. Many of her friends were picked off in the night (by owls we think) when they wouldn’t stay in their house and eventually she was the only one to remain. She quickly learned the ways of chickens and now sleeps in the coop and lays her eggs in the boxes. In the last month we have welcomed back the middle school students twice a week on Tuesdays and Fridays as well as the elementary students on Wednesdays. Tuesdays are the start of our work week and we spend most of it harvesting for the farm stand and restaurants. Middle school farm groups have been working with Bob to harvest, wash and pack produce like carrots, potatoes, winter squash, onions and more. They send the farm an order on Monday for produce they wish to buy wholesale and then sell thru their market at school. When they are at the farm on Tuesday they help to get this order ready and take it back with them to sell on Wednesday. Friday’s farm group has also been helping with harvest as we are focusing on preparing for restocking the stand as well as attending the Saturday Farmers Market. In addition to harvest, middle school students have been working on digging out a trench to run power to their outdoor kitchen and camping area. I am always amazed at how much these groups love to dig! This fall we will be focusing on Earth Science including a soil mapping project. The elementary students have been working hard to help bring in the nut harvest. We have harvested over 100 lbs of hazelnuts and have just begun the gather chestnuts. Other projects have included gathering winter squash from the field, spreading compost in the fields and collecting eggs. This week we will begin winnowing our dry bean harvest, which is always a favorite! Elementary farm groups typically work with Jen in the morning and then after lunch have time for journaling, artwork and/or free time. This Saturday we will host our annual fall work party from 10-2pm. We have some fun projects for cleaning up and putting the farm to rest. We hope you’ll join us! We have had quite a busy summer here on the farm and it’s not slowing down yet! We are currently at the peak of our harvest with the vast majority of our time focused on harvesting, washing and packaging produce. Our roadside stand is open from dawn to dusk, 7 days a week and requires restocking several times a day. Our customer base has grown over the years and the farm stand has become a local favorite and our most consistent outlet. We also spend Wednesday evening and Saturday morning at the Village Green in Vashon town, selling our produce at the Farmers Market. This year the Vashon Farmers Market continues to grow and expand and we have seen our best sales to date. We are selling direct to two new restaurants, Gravy and Bramble House and occasionally to the natural food store, Minglemint. We look forward to working with the Middle School students this fall who will be managing a farm stand at school to share this beautiful produce with the Pacific Crest community! Here’s a glimpse of what we are harvesting these days…Salad mix, carrots, beets, potatoes, tomatoes, peppers, radishes, cucumbers, squash, strawberries, plums, pears and apples! YUM! In addition to all those delicious fruits and vegetables, we are collecting a couple dozen eggs every day from our laying hens. Our turkeys are growing quickly and brings a new energy to the farm. We are enjoying their happy little gobbles and clucks as they cruise through the walnut orchard in unison. The spring lambs are growing fast and soon will be a big as their mothers. A few are still nursing and all are full of energy and have become quite adept at breaking out of their electric fencing, much to our dismay. With the coyote population growing and now a cougar hanging around, they better stay in that fence! There have been a number of school gatherings on the farm this summer. 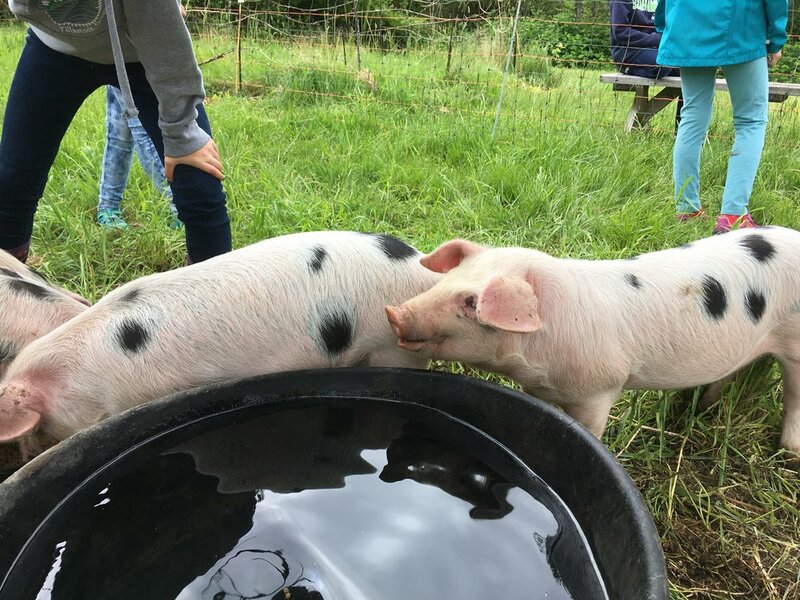 We had our first two “Picnic on the Farm” events and both times welcomed a great group of families out to explore the farm and learn more about its operation and the many opportunities for students here. In July we hosted the first Middle School farm camp, led by teacher Chuck. Eight students joined us for an entire week, managing their camp and meals but still meeting us every morning at 7am to begin the day with yoga before heading out to plant, weed, and/or harvest. They swam at the local pool in the afternoon, harvested veggies for dinner and enjoyed each other’s company at the fire pit at night. On Saturday they joined us at the farmers market and groups of two took turns helping us work the booth. They really enjoyed seeing all the crops they had worked with over the week in a beautiful display. It really was a great week! The first week of August was Elementary School farm camp. Sonya and Jen organized a fun camp for 14 elementary students with help from 8th grader Anna Wilk and her brother, Pacific Crest alum, Sam Wilk. The group helped us with a big invasive weed removal project where we pulled and cut flowers from patches of tansy ragwort. They gathered fallen apples for the chickens and a big load for another farmer’s pigs. We also worked on a big swath of blackberries that were taking over the pond’s edge. Speaking of blackberries, they gathered many and hand-churned some delicious looking ice cream, to follow one of their dinners at the outdoor kitchen. The farm hosted a family campout that was bid on and won at last year’s auction. We had a fun group out and a delicious meal served up by Seonaidh Davenport, Brian Sharon and Scott Hasenkamp. The wall tents were decorated with lights, the campfire was burning and there was even an amazing farm-fresh plum crisp for dessert! With all of the work that goes on here on the farm, Bob and I are grateful to welcome interns each season. Our interns work full-time with us from March into November. They participate in all aspects of farming as well as leading students and volunteers with weeding, harvest and other projects. It’s a big commitment on their part and we couldn’t do it without them! This season we have Jacquie Henning from Nebraska and Jessica Davidson from Gig Harbor, WA. 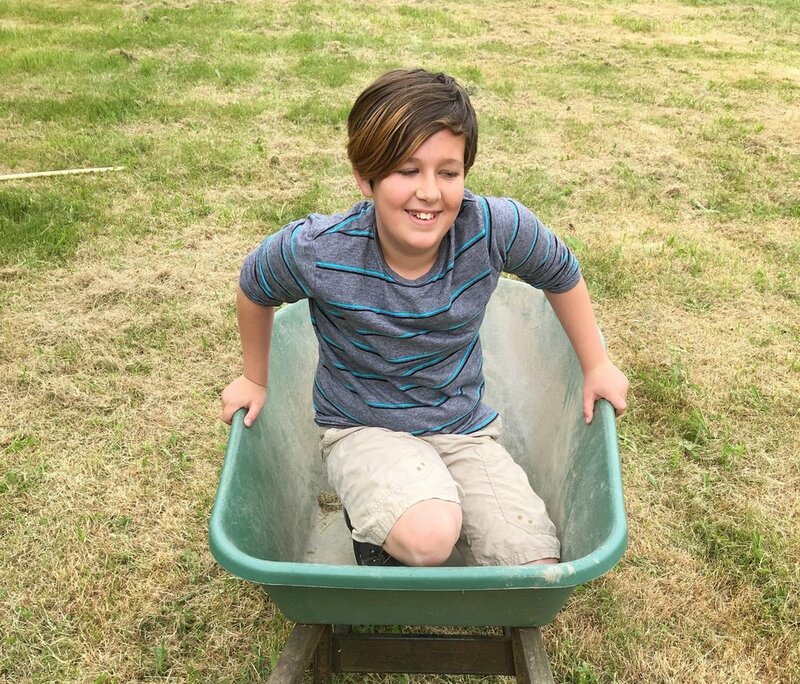 As September approaches we are planting our final successions, beginning to think about compost and fall cover crops, planning for the return of regular school groups and looking forward to welcoming everyone out for the annual Cider Press on September 17th. See you then!